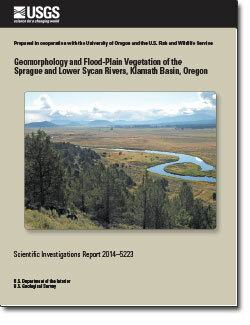 The USGS documents historical and current channel and floodplain processes and conditions to assist management and regulatory agencies in evaluating restoration proposals and designing effective restoration and monitoring strategies for the Sprague River and its principle tributaries. The study involves multiple analyses, including assessments of historical channel change, riparian and floodplain vegetation, and surficial geology. To support these analyses, digital floodplain and channel maps were prepared to depict channel and floodplain conditions at different times. The geospatial database of current and historic channel and floodplain conditions will also enable evaluation of long-term trends pertaining to aquatic and riparian habitat conditions. O'Connor, James E.; McDowell, Patricia F.; Lind, Pollyanna; Rasmussen, Christine G.; Keith, Mackenzie K.
O’Connor, J.E., McDowell, P.F., Lind, Pollyanna, Rasmussen, C.G., and Keith, M.K., 2015, Geomorphology and flood-plain vegetation of the Sprague and lower Sycan Rivers, Klamath Basin, Oregon: U.S. Geological Survey Scientific Investigations Report 2014–5223, 122 p., 1 pl., http://dx.doi.org/10.3133/sir20145223.